Royal Caribbean International officially took delivery of the 26th ship in its fleet, Spectrum of the Seas, in a ceremony in Germany today (April 11). The first in the Quantum Ultra class of ships, Spectrum will homeport in Shanghai, starting in June 2019, as it will be dedicated to sailing from China. 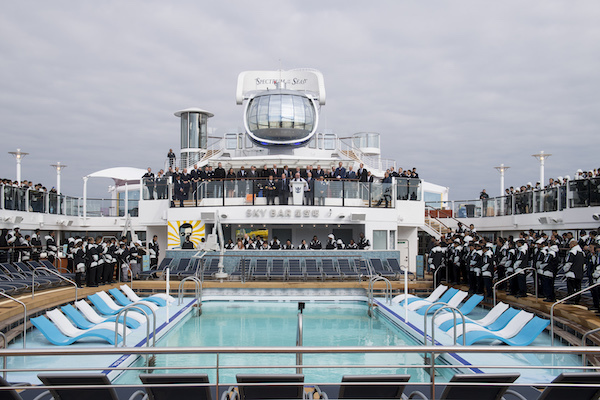 Richard Fain, chairman and chief executive of Royal Caribbean Cruises Ltd, and Michael Bayley, president and chief executive of Royal Caribbean International, received the ship at an official handover ceremony at Meyer Werft Yard in Bremerhaven. Spectrum will feature the cruise line’s first private enclave for suite guests at the forward end of the ship, on decks 13 to 16. Passengers in these luxury suites will have a private elevator, a dedicated restaurant and lounge, and access to The Balcony – a private outdoor space for sunbathing. New concepts include Sichuan Red with cuisine from the Sichuan province of China, and the cruise line’s first Star Moment karaoke venue. Royal Caribbean International said the 4,246-passenger ship will be the largest and most expensive ship in Asia when it reaches Shanghai on June 3. Before then, it will sail a 46-night Global Odyssey from Barcelona, visiting ports along the way.